1. Gray, Grey : سرمئی لباس میں ملبوس : (noun) clothing that is a grey color. Libas, Pehnawa, Pahnnay Kay Kapray : Clothing : a covering designed to be worn on a person's body. Surmai Libas Me... : Grey : clothing that is a grey color. "He was dressed in grey"
Jhalak : Color : an outward or token appearance or form that is deliberately misleading. "There was not a semblance of law and order"
Rang : Color : a visual attribute of things that results from the light they emit or transmit or reflect. "A white color is made up of many different wavelengths of light"
Rang : Color : any material used for its color. "She used a different color for the trim"
Be Rang Karna, Rang Uraana : Color : change color, often in an undesired manner. "The shirts discolored"
How this page explains Surmai Libas Mein Malbus ? We help you understand the word Surmai Libas Mein Malbus in English. 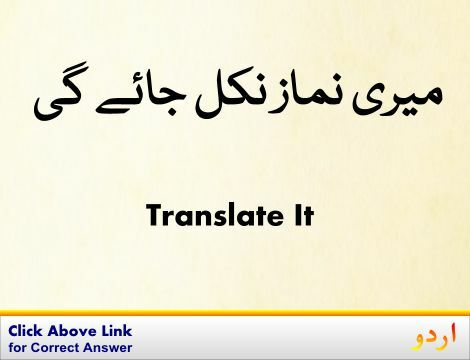 We not only provide English meaning of سُرمئی لباس میں ملبوس but also give extensive definition in English language. You can also find multiple synonyms or similar words along with Surmai Libas Mein Malbus. You may also want to see Android app to get سُرمئی لباس میں ملبوس, please install Wordinn Urdu Android app now.